Wondering if you may have symptoms of depression, bipolar disorder, or anxiety? Cornell students can take a free, confidential screening online. To wrap up Mental Health Wellness Week, the Counseling Center challenges you to put aside Facebook, Snapchat, Twitter, Instagram, etc., for a NO FOMO Friday! FOMO (fear of missing out) is what you experience when you compare your life to others’ highlight reel on social media. Anxiety and depression can ensue if it seems like others are having more fun, look better, or are more successful than you even though you are only seeing a carefully crafted look into their lives without the rest. If you are struggling with stress or mental health concerns, experiment by limiting access to social media today. Instead of looking at your phone, engage in activities such as having a face-to-face conversation, playing board games or going for a walk. Take inventory attention to your strengths and practice gratitude, observe what happens! Want to know more? 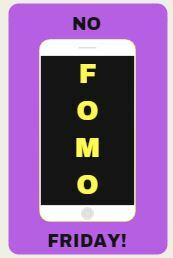 Learn more about FOMO and tips for changing your smartphone use, and check out this block’s Counseling Center bulletin board in the Thomas Commons! 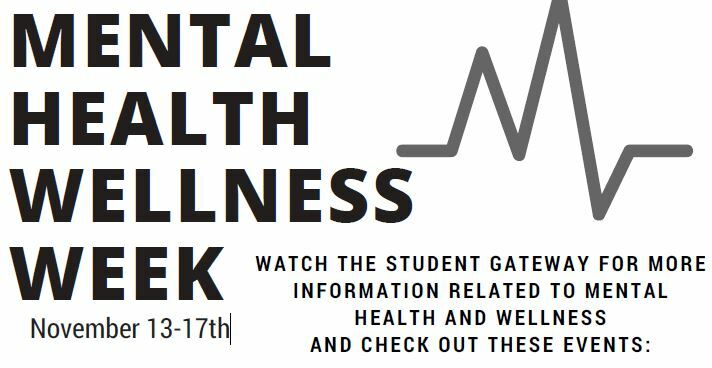 It’s Mental Health Wellness Week! Click here for stress management tips and don’t forget to stop by the Stress Free Zone, Thursday, November 16th over lunch, or visit the Stress Free Room at the Counseling Center! It’s Mental Health Wellness Week! Learn why mental health is important for college students. 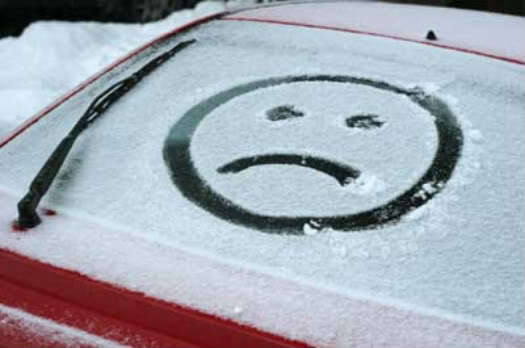 Visit the Counseling Center’s website for self-assessments and resources. Concerned About a Friend? Friends supporting each other through both good and bad times is part of mental health wellness. Wondering what you can do to help a friend who may be distressed, depressed, or thinking about suicide? Click here for information, suggestions and resources. And, come to the program “What Can I Do: How to Recognize and Help When Someone is in Distress”, Tuesday, November 14 from 11:15 am – 12:15 pm and 3:15 – 4:15 pm in the Stockholm Room. Questions? 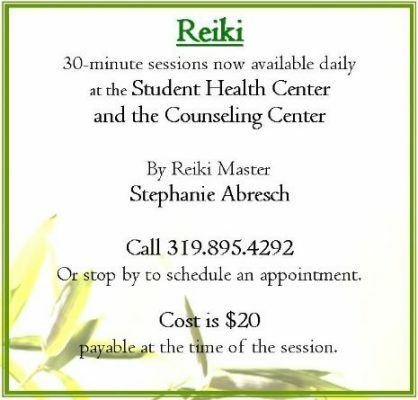 Call the Counseling Center at x4292 (319-895-4292). Reiki is a Japanese technique of stress reduction and relaxation that also promotes healing. Are others worried about your alcohol use? Are you? confidential screening online to check out your drinking behaviors. How often do you feel fearful, anxious, tense, worried, vigilant, or startled? confidential screening online to see if you may be experiencing symptoms of anxiety. Are you concerned about your eating – or are others concerned about you? confidential screening online to see if you may have symptoms of an eating disorder.